Jameson Marvin, Director of Choral Activities for the Holden Choirs for the past three decades, conducts a rehearsal of Harvard’s co-ed Collegium Musicum with characteristically quirky zeal. At 8:30 on a Tuesday night, all is quiet in Memorial Hall. The tourists who spend their days shuffling around outside the exit to Annenberg Hall have shuttered their cameras, rubbed the John Harvard statue once more for good luck, and gone back to their hotels. Inside Sanders Theatre, however, all is surreal chaos. A wiry, white-haired man sings a complex passage of music without any consonant sounds while encouraging the chorus that encircles him to enunciate more. When he finishes the passage, the entire chorus starts whistling, and he grins sheepishly before counting them off. As they sing, he rises on his toes, bends his knees, and rocks back and forth, his mouth moving in time to the music and his feet quivering across the platform. One might easily think the entire sound of the 65-man Glee Club is emanating from Jameson N. Marvin, the Holden Choirs’ Director of Choral Activities and a Senior Lecturer on Music. This June, after 32 years of conducting at Harvard, he’s stepping down. 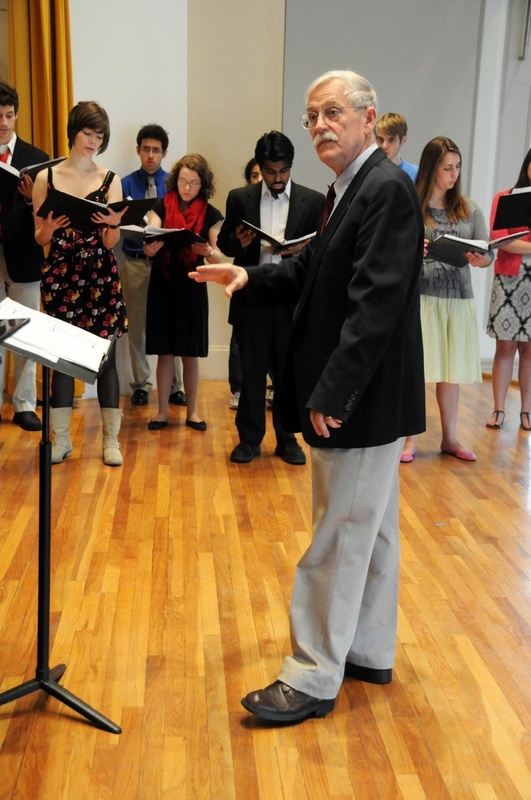 Marvin, affectionately known as “Jim” by his students, is the latest of five conductors for the Holden Choirs—composed of the Glee Club, Collegium Musicum, and the Radcliffe Choral Society—since the Glee Club was founded in 1858. Marvin holds one of the most prominent choral conducting jobs in the country: the Glee Club and the Radcliffe Choral Society are, respectively, the oldest men’s and the oldest women’s collegiate chorus in the country. “Jim has elevated all three groups to a level of national recognition that I don’t think any of them really had,” says Adam M. Gann ’12, the Glee Club Historian. “Jim’s legacy, the thing that Jim is particularly good at, is making the three different sounds—Men’s, Women’s and Mixed—sound particularly good, whereas most conductors will only have experience with one or two of those types,” says Stacey R. Hanson ’10, Manager Emerita of the Radcliffe Choral Society. The level of excellence shared by all three of the choruses has been one of Marvin’s most significant achievements in his historic tenure. “I wanted them to sound equal to each other so that there was this wonderful community of kindred spirits,” says Marvin, sitting in his Paine Music Hall office crowded with posters from past performances, an upright piano, and a towering bookshelf stuffed with sheet music. He taxes his students, pushing for a level of excellence that some professional choirs never attain. In 2003, for a celebration of Marvin’s 25th year in his position, the choruses sang Beethoven’s “Missa Solemnis.” The performance required an unprecedented amount of dedication, but elicited an effusive wave of praise from its audience. It received a glowing review from the Boston Globe: “Beethoven’s bursts of scurrying fast-tempo polyphony were as sure, swift, and unimpeded as mere human agency could make them,” wrote correspondent Richard Buell, “additionally enlivened by the performers’ awareness (visible in their faces and demeanor) that they were indeed daring the impossible.” Marvin was praised throughout the piece. “It was the kind of conducting that has a lot of ‘there’ to it but somehow disappears, egolessly, into the music,” Buell added. Even to the untrained ear, the sound of the Holden Choirs is impressively unified and unique. Marvin is renowned for his unparalleled talent in choral direction, and he is also credited with the creation of a particular ‘Harvard sound.’ Marvin’s long-time friend Kevin C. Leong, the Associate Conductor of the Holden Choirs, sees this musical achievement as one of Marvin’s greatest. In essence, Jim is a musician who has the ability both to play and to sculpt his instrument, and the students in the choirs are the most essential part of that instrument. “They were the Holden Choirs before, but it was more an internal name that was used. It was not, as it is now, an external name,” Marvin says. The Choirs were initially known as the Holden Choirs simply because the groups all used the Holden Chapel as a rehearsal space. Under the exuberant direction of Marvin, however, the Holden Choirs have become a cohesive entity within the school.